To reverence someone is to acclaim that person, to regard him highly, or to acknowledge his supremacy or influence or his strength and abilities. One definition of "reverence" is to fear. Many Christians, relying on biblical texts, reverence Satan by recognizing him as the god of the world in which they live. Whether they intend to or not, believers in Satan exalt him and bestow upon him tremendous honor. Hate him or love him, they grant him amazing wisdom and dominance. 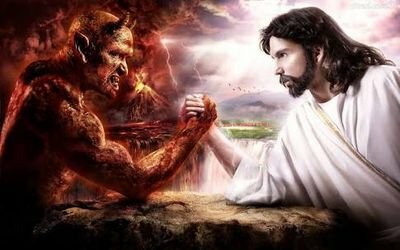 These fearful souls seemingly believe Satan has more power in this world than Jesus Christ does because, they claim, Jesus hasn't yet been able to defeat Satan. Therefore, he walks about as a roaring lion, seeking whomever he desires and causing humans grave harm--physically, mentally, emotionally, and spiritually (1 Pet 5:8). In the minds of those who believe in him, Satan obviously possesses more authority and preeminence than Jesus because Satan, not Jesus, is the prince of this world (Jn 12:31). Satan obviously possesses more authority and preeminence than JesusAdmittedly, while most Christians believe Jesus has not conquered Satan, they think they themselves can withstand his wiles if they try hard enough. Still, they accept the supremacy of Satan and therefore fear him. It's the same as it would be if they regarded Zeus as a mighty, fearsome deity. They would be believers in Zeus and his power, esteeming him as the god reigning over their sphere of existence just as they believe in Satan and his power as the god who governs the earth. Never mind that Yahweh might be a higher god than Satan; the fact remains that many Christians view Satan as the "god of this world" (2 Cor 4:4). Not long ago someone called me a Satanist because I do NOT believe in Satan--and the rest of the biblical story. If you fear Satan or acknowledge him as the ruler of the world, please don't call me a Satanist. If indeed anyone is a Satanist, it's those who believe in Satan and his reign over the earth.